London implemented area-wide congestion pricing in 2003, an economic strategy used to manage private motor vehicle demand. Innovative parking management and low emission zones (LEZs) are two other vehicle demand management strategies being increasingly used in industrialized economies. Photo by Scott Barren. This is the fourth post of the “Sustainable Urban Transport On The Move” blog series, exclusive to TheCityFix. This “On The Move” series is dedicated to analyzing on-the-ground efforts to shift urban transport from moving cars to moving people. It presents emerging, trendy, and mainstream solutions leading this transition, and tracks progress being made by cities already adopting measures to enhance accessibility. Preparation of this series was possible thanks to a grant by Shell Corporation. Its contents are the sole responsibility of the authors. More and more government officials, urban planners, and public transport operators around the world have begun experimenting with techniques to combat increasing rates of private motorization and car usage. These techniques are called vehicle demand management, a blanket term that refers to policies and strategies that seek to limit vehicle ownership and usage. The goal of vehicle demand management is to mitigate vehicular traffic volume in order to relieve traffic congestion, improve air quality, enhance public health, and promote other sustainable modes of transport. Limitations on vehicle ownership include quotas on vehicle registration, whereas limitations on vehicle use discourage travel or enact trip restrictions. Both types include economic or regulatory instruments, or a combination of both. For a long time the prevailing paradigm for planning transport has been to “predict” the need for vehicle capacity and “provide” that capacity in the form of building highways and providing traffic management solutions. We now observe that alternative demand management policies, like innovative parking management, congestion pricing, and low emission zones (LEZs) are gaining attention worldwide. A growing number of cities in both industrialized and emerging economies are including them as part of their various transport policies, as shown in Figure 1. Figure 2 displays the various types of limitations on car ownership and usage. Figure 1. Number of cities implementing specific vehicle demand management strategies. Graphic by EMBARQ. Creative Commons: Attribution. Figure 2. Types of limitations on car ownership and usage. Graphic by EMBARQ. Creative Commons: Attribution. Since the 1960s and 1970s, there has been a gradual shift in parking management in Europe and the United States toward stricter regulation on personal vehicles’ use of land and public spaces. This shift has been particularly focused on street parking due to the impact of “the high cost of free parking” – a powerful concept introduced by Professor Donald Shoup. These new parking policies often include regulatory measures that determine level of supply, including banning access to private vehicles, eliminating minimum parking spaces in zoning regulations, market-oriented pricing mechanisms, converting parking spaces to open public areas, and parking-related technology applications. Throughout the past five decades, these parking management approaches have been gradually adopted by many large and influential cities in Europe and the United States, including Copenhagen (1970s/2002), Strasbourg (early 1990s), London (early 1990s), Munich (1993), Paris (1991), Stockholm (1970s), Zurich (1960s), Boulder (1970s), Chicago (2000s), New York (2000s), Portland (1970s), and San Francisco(1970s/2000s), among others. Some Asian cities such as Tokyo (2010) and Singapore (2006) have also applied similar strategies. While information on the topic is still scarce, it’s possible that the number of cities adopting parking management is still quite small. A second policy that has been adopted by many cities is congestion pricing, an economic strategy used to manage private motor vehicle demand. It can be applied to periods of high congestion, or peak hours, heavily congested locations like downtown or business districts, or travel corridors such as important access bridges and highways. Large scale road-based pricing projects have been implemented in many major European countries throughout the past three decades. In the United States, the implementation of High Occupancy Toll lanes (HOT lanes) and day pricing on some highway facilities has become common. Only recently, however, has area-wide congestion pricing received widespread adoption. Area-wide congestion pricing was introduced in Singapore as early as 1975. More recently – and with public attention – London (2003), Stockholm (2007), Valetta (2007), Milan (2012), and Gothenburg (2013) joined Singapore in implementing congestion charges in congested urban centers. This policy, aimed at improving air quality and relieving traffic congestion, is also bringing greater revenue to investment in public and non-motorized transport. 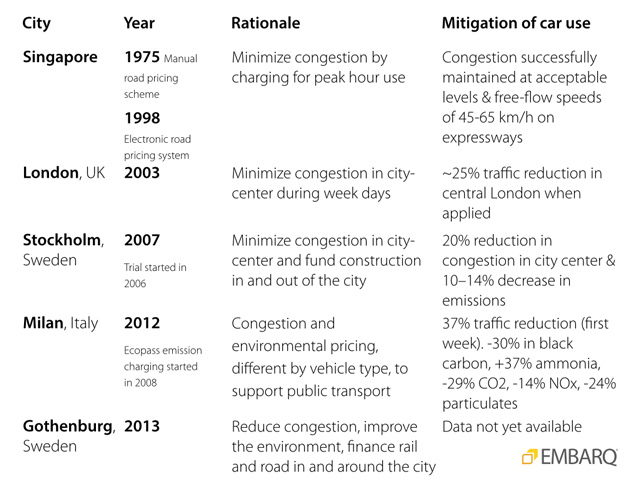 For example, London earned USD $215.5 million in congestion pricing revenue in 2010. Table 1. Congestion pricing strategies in selected cities. Table by EMBARQ. Data sources: American Association of State Highway and Transportation Officials (AASHTO), Deutsche Gesellschaft fuer Internationale Zusammenarbeit (GIZ), ITS International. Creative Commons: Attribution. 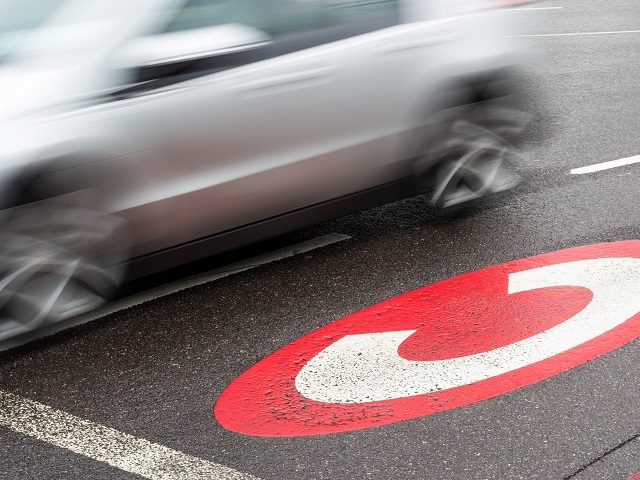 A third vehicle demand management policy that has grown in popularity in recent years are low emission zones (LEZs) – areas or roads where polluted vehicles are banned or charged for entering if the vehicle’s emissions are over a set level. The first recorded LEZ appeared in Tokyo in 2003. Since 2006 they have been implemented widely in Europe, in part due to the European Union’s health-based air quality standard. Today, over 200 cities in Europe have LEZs. Figure 3. Growth of low emission zone cities in Europe. 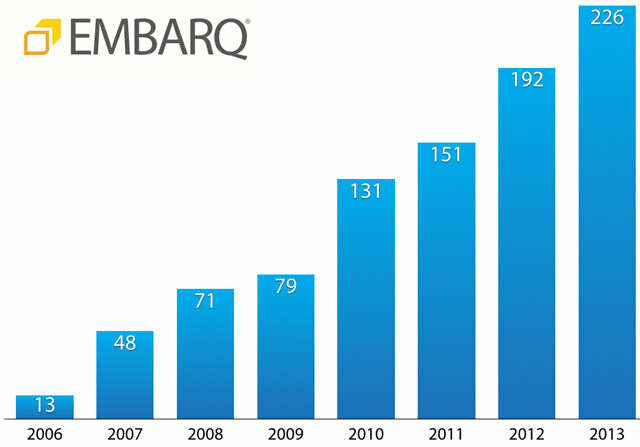 Graph by EMBARQ. Creative Commons: Attribution. 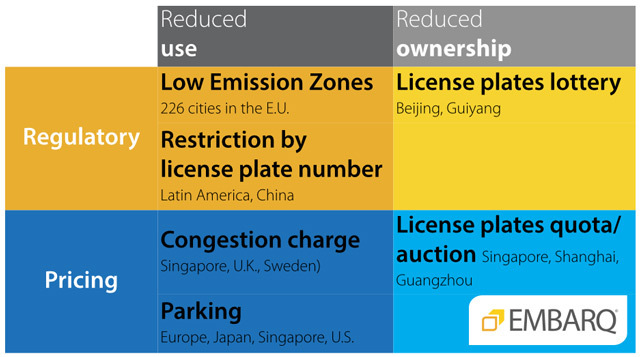 Innovative parking policies, congestion pricing, and low emission zones are three techniques of vehicle demand management being increasingly used in industrialized economies. Stay tuned for tomorrow’s post on TheCityFix – the next blog post in this series – which will examine vehicle demand management policies in emerging economies. Dario Hidalgo, Anajali Mahendra, Aksahy Mani, Aileen Carrigan, Benoit Colin, and Kyle Mackie contributed to this blog.